Listed below are some of the Geological maps and guides which we keep in stock. If you cannot see the item you require here, please contact us. Not yet available for the whole of the UK. Geological maps show the nature, extent and relative stratigraphical age of the different rocks within a district. 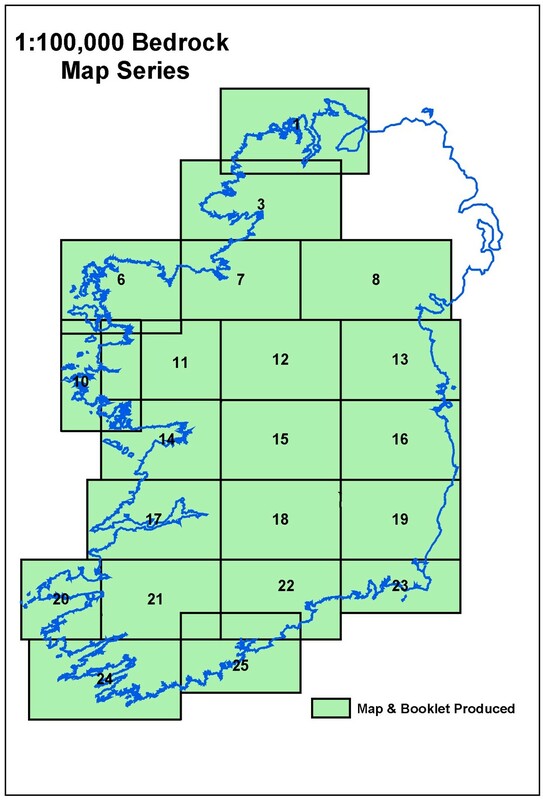 For England and Wales (and Northern Ireland), map sheets normally cover an area 30 km east-west and 20 km north-south; in Scotland, the coverage is 20 km east-west and 30 km north-south. The 1:50 000 geological map grids are based on an early Ordnance Survey 1:63 360 scale map (one inch to one mile) grid, and are not related to the current OS 1:50 000 map sheets. 'Special' geological sheets are produced for areas of major geological interest which are covered by more than one 'normal' map sheet, provide a composite map of the district and may be available in different versions. 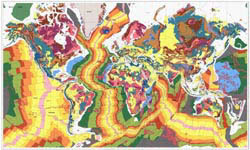 1:625 000 Bedrock Geology Map of the UK - These maps (at an approximate scale of ten miles to one inch) provide coverage of the solid geology of the UK over two map sheets; North or South. Please state which sheet is required when ordering. The original map was produced in 1820; this reproduction in 1993, from a copy held at the Natural History Museum in London. Poster size: 50 x 56 cm (portrait format). We are delighted to be able to offer a reproduction of William Smith's famous 1815 geological map of 'England and Wales with part of Scotland' (series 53, issued between 2nd Nov 1815 and 17th Dec 1815). Smith's 1815 map was the subject of Simon Winchester's Map that Changed the World. This map was never published as a single sheet. The large size of the original map and the size of the printing presses in the early 19th century meant that it had to be published in fifteen sections, each folded into six 'panels'. We have scanned the original panels held in the BGS Library, and digitally removed the joins. At its original scale of five miles to the inch, the map would have been eight feet long by six feet wide if it had ever been published as a single sheet. Our reproduction is published at half scale: ten miles to the inch, and is colour-matched to the original. The original maps are valuable and fragile; viewing is by appointment only. Now this beautiful half-scale reproduction means that Smith's achievement can, at long last, be widely appreciated. Due to new postage regulations we are now unable to dispatch the Flat map by 1st class delivery. Unfortunately we are not able to send the flat map to overseas addresses because of the size. A New Geological Map of England and Wales, with the Inland Navigations; Exhibiting the Districts of Coal and other Sites of Mineral Tonnage. By W Smith, Engineer. 1820. This map has been reproduced from an original of William Smith's 1820 map held in the BGS Library in Keyworth. The original was split into sections, mounted on linen and folded. This reproduction has had the section-marks and folds digitally removed, is the same size as the original, and is colour-matched. Poster size: 76.5 cm x 63.5 cm (portrait format). This guidebook describes the geology, scenery and mining history of West Cornwall and illustrates how these are linked to aspects of the natural and social history of the region. The wild landscape of Assynt is one of Britain's most beautiful areas; home to Britain's oldest rocks - the basement rock of the area, the Lewisian Gneiss, was formed an amazing 3000 million years ago. Over time, the area has gone through mountain-building, been submerged beneath shallow tropical seas, has collided with continents, and been massively eroded by ice, before the first people took up residence there around 2500 years ago. This unique book and map pack describes eight walks in Assynt, ranging in difficulty from easy to challenging. These are described in detail, and illustrated with photographs and paintings. The fold-out colour map shows the different rock types which make up the area and has the walks and other sites of interest marked. A5-sized; 55 pages with full colour illustrations. Earthquakes are in the news, even in Britain. This book helps those who want to get to grips with all aspects of the subject in laymans' terms. This book focuses on British fossils and the story of life on our islands. Includes details of the great fossil collections of Britain. Over 100 colour photos and illustrations. Many areas of the UK are dependent on groundwater for their water supplies. This book explains clearly how and where groundwater occurs, how it is used and how it is at risk. Malt Whisky distilleries use local waters which have percolated through the ancient rocks of Scotland. This book describes the geology of Scotland and Northern Ireland in relation to the important malt whisky producing districts, and offers new insights into the influences on the taste of a good single malt. Fully illustrated throughout by renowned wildlife artist Richard Bell. Published the the GA in conjunction with the British Geomorphological Research Group. Each guide, prepared by a subject expert, has full colour photographs, high quality original cartography and illustration and, with the support of the Ordnance Survey, the Ordnance Survey Ireland and the Ordnance Survey of Northern Ireland - map extracts. All titles in this series include a glossary of terma snd ideas for further reading. Ideal for post-16 geography students and the educated amateur. The following titles are currently available. These concise guidecards provide a wealth of information on major fossil groups found in Britain and Europe, including trilobites, ammonites, fish, corals and plants. They feature many colour diagrams and photographs and are produced as folded A3 laminated cards. The following titles are currently available. Herefordshire and Worcestershire RIGS Group (RIGS - Regionally important Geological/Geomorphological sites) - mostly �95 each. The following 'Explore' titles are currently available.